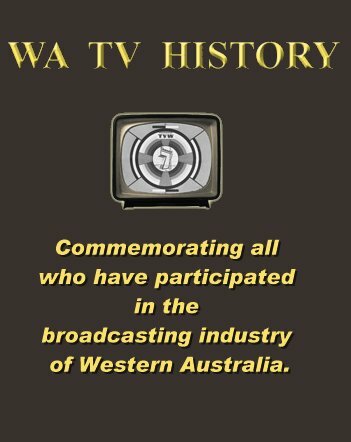 The story of newspapers, telegraph, cinema, radio, television and the internet, and the impact they have made on the lives of Western Australians over the years. 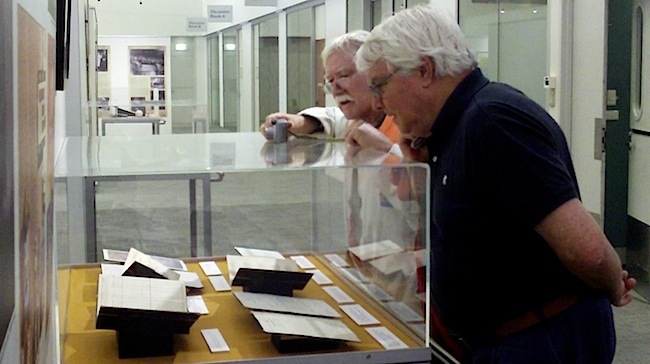 Two Channel Seven veterans, Richard Ashton and Gordon McColl, visit the State Library of Western Australia’s latest exhibition at 25 Francis Street in Northbridge. 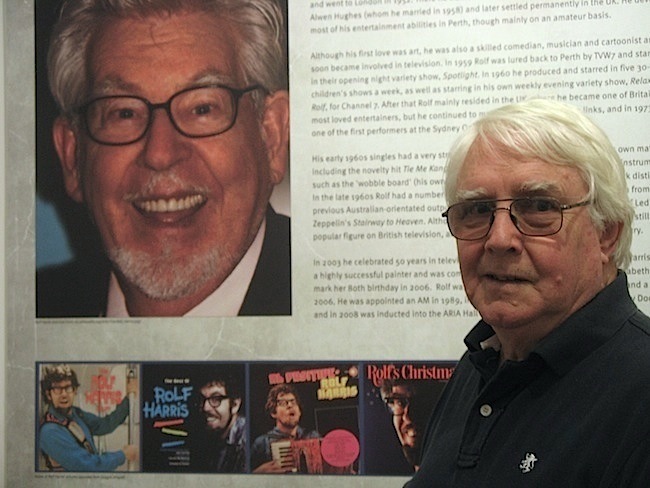 It was of particular interest to both gentlemen, having worked closely with Rolf Harris as he entertained Perth during the pioneering first year of television in Western Australia. 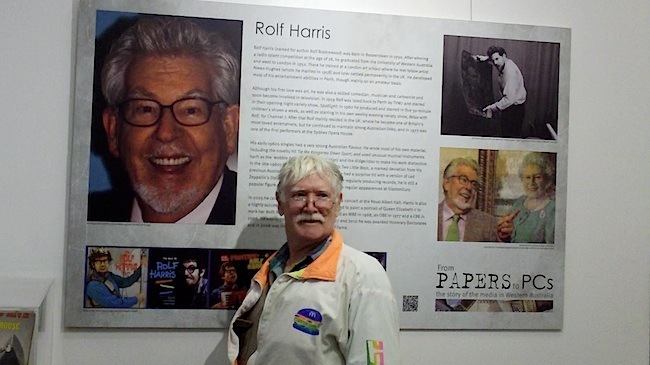 Rolf was a feature of the exhibit. 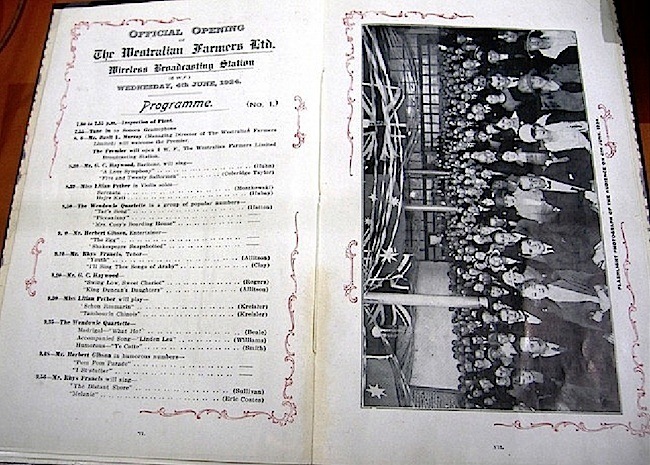 Richard Ashton was also delighted to view a copy of the opening night programme for 6WF, Perth’s first official radio station, for Richard’s Aunt Lil (Miss Lilian Pether) performed on the opening night and his Aunt Connie (Miss Constance Pether) performed on the second night. 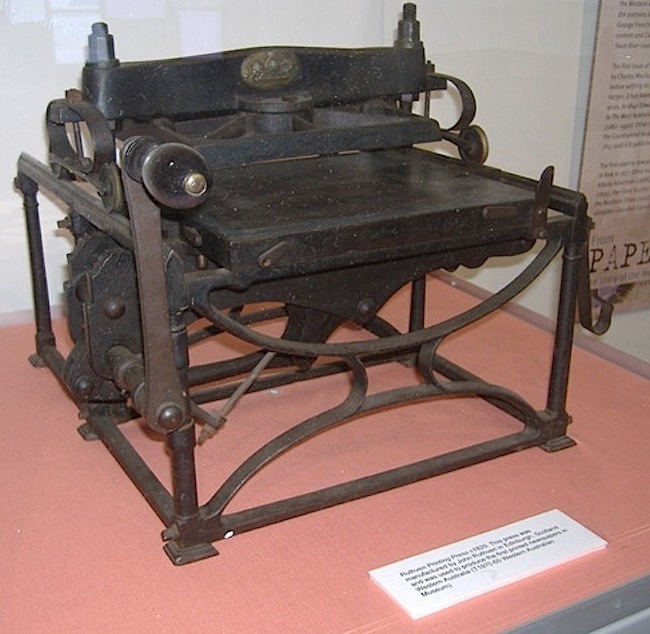 The next highlight was to see on display the little Ruthven Press, which was the first printing press introduced into the colony of Western Australia in 1831 (Richard will detail the history of this press in a separate article). There is a family connection for Richard, as his great grandfather Richard Pether was the Government Printer from 1870 till he retired in 1901. In this role, he used the antique Ruthven printing press one hundred years later, to print commemoration copies for a special demonstration. It was a case of the State’s oldest printing technology being used to reproduce material created by the newly imported and revolutionary Monotype typesetting machines, the first to be imported into Australia. He provided this demonstration to senior government officials who visited the printing office to witness the historic occasion. 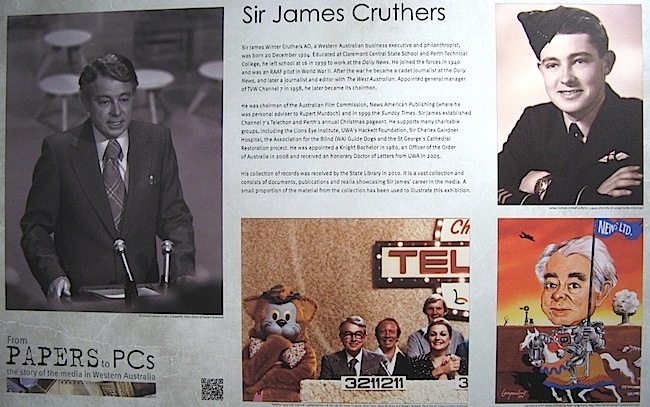 Also featured at the Library exhibition is material from the recently acquired Sir James Cruthers Archive, including material showcasing Rolf Harris’ return to WA in 1959 as a star for Perth’s first television station TVW7, material from a number of State Library collections, as well as temporarily loaned items from Channel 7, the Australian Museum of Motion Pictures and Television and the WA Museum. 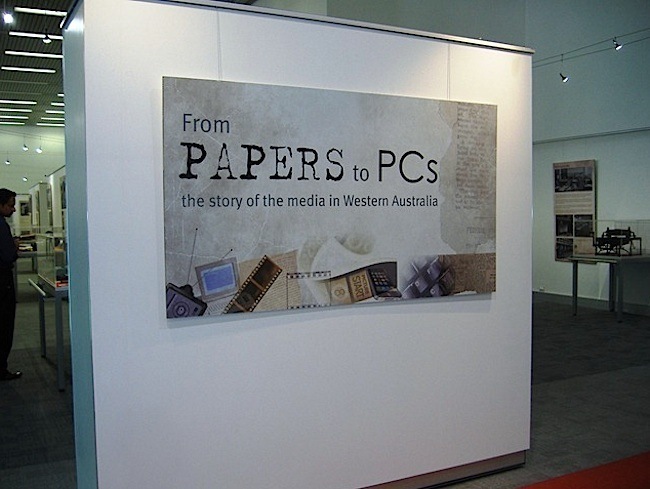 This exhibition marks the growing interest the State Library and Curtin University of technology has in helping to document, preserve, provide access to and research the media and its influence on Western Australian society. It showcases just some of the materials which form the basis for an envisioned digital (and physical) media archive and, to that end, the State Library is keen to impress on organisations and individuals involved in the media to consider the library as a final repository for their records, where they will be made available to all Western Australians and the world, through the web. The exhibition is being held in The Gallery (Ground floor) from 27 October 2011 to 15 January 2012. 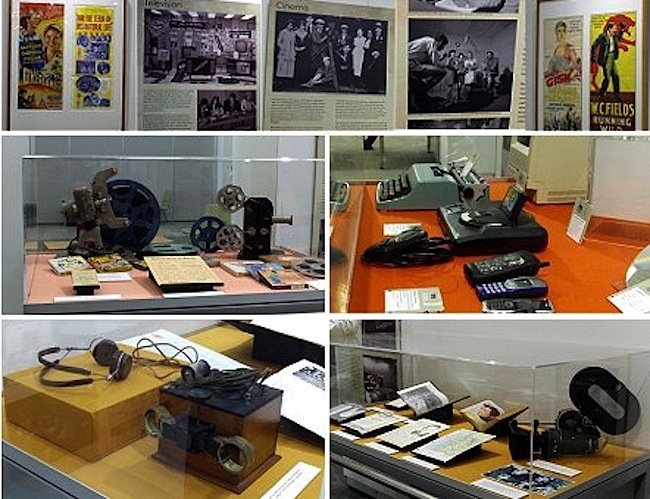 It is a free exhibition, held during the State Library opening hours of 9:00am to 5:pm – no booking required. Rather than spoil the occasion and show everything here, we recommend you visit the Library and enjoy this memorabilia first hand.